Blurb: This epic tale about the effects of the Russian Revolution and its aftermath on a bourgeois family was not published in the Soviet Union until 1987. One of the results of its publication in the West was Pasternak's complete rejection by Soviet authorities; when he was awarded the Nobel Prize for Literature in 1958 he was compelled to decline it. The book quickly became an international best-seller. Review: Reading this book was not an easy thing to do, not only is it quite long but it is also translated from Russian- sometimes this is done quite well, but other times it is clear to see that the word subistuted in English does not fit into the sentence the way the original Russian word would, this is probably why it took me one day short of a month to read this book. Despite this, I still managed to enjoy it. I've been told by some friends that the original Russian version of this book is absolutely marvellous, though with my inability to speak or read any Russian at the moment I'm going to have to be happy with this English version for now. Going into this book I didn't really know what to expect, firstly I was slightly terrified by the fact that this was to be the first translated novel that I'd attempted to read and that the book I had chosen to read had been translated from Russian, which as I said is not a language I even remotely understand (looking back now it probably would have been smarter to attempt a novel translated from French, a language I actually know...) but I do not regret reading this book at all. Secondly, while I knew the book was set in Russia sometime during Bolshevik era, I really knew nothing about it at all. I was plesantly surprised by the novel, possibly even more than I thought I would be. I think a big part of this was due to the history student side of me who picked up on all the little details that Pasternak through in about the Revolution and life before and after it. This being said, I don't think you have to be a history student or even like history very much to enjoy this book. The majority of this book is not so much focused on the historical side, or plot driven, instead it focuses on the character's lives, especially the romance of Yury (sometimes translated as Yuri) Zhivago and Lara Antipova. I grew to love each of the characters, all for different reasons and despite their flaws- I think this in itself is what makes a good book, a really good book. It's also one of the reasons, I believe, that Doctor Zhivago has stood the test of time. In addition to my love for the characters, I adored 'Zhivago's' poems were all collected and tacked on to the end of the novel in my version in the order which they appeared. The poems definitely added to my enjoyment of this book and I think I liked them being added at the end more than I would have if they'd been within the novel, in a way they show the development of Zhivago's character throughout the novel that would not have been possible otherwise. I'm sorry if this review is too focused on the translation side of this novel, but I felt like it was necessary to include it otherwise I felt like there was no point raving about the book without mentioning that it is in fact a translation. However, if you enjoyed this review but have never read a translation before, or maybe just not one from Russian, then I would definitely recommend that you read this. Even though there are a few words here and there that do not fit perfectly, as a whole the book is truly magnificent. 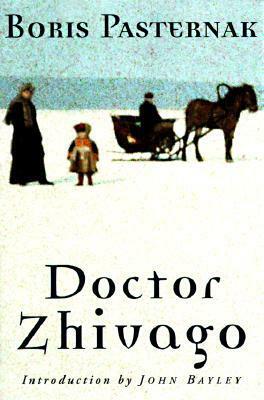 You can buy 'Doctor Zhivago' on the Book Depoistory (with free shipping worldwide), here. *The copy linked to and the copy reviewed are different versions of the novel, and therefore different translations.